Earth Day is a day that is recognized to help better our planet Earth. It is every year on April 22nd. Restored Ministries for the last couple of years have gathered in groups to go serve, pray, bless, and love on others in our community. 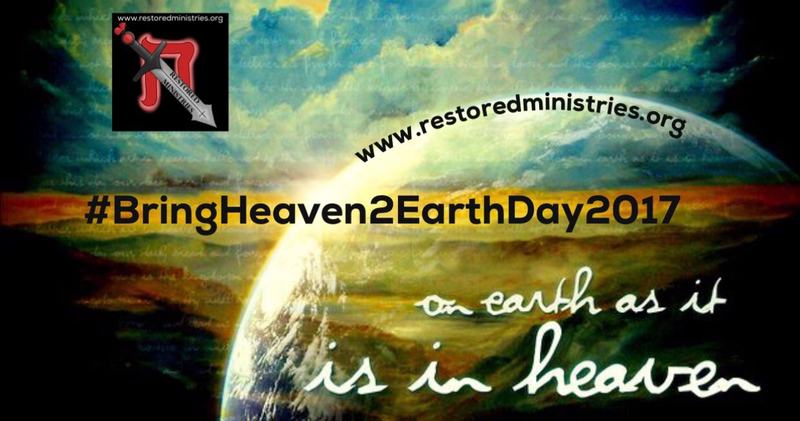 What does #BringHeaven2EarthDay look like? It is going out into your communities and neighborhoods to bless those around you. It is blessing and loving on those in your own family or household. It is showing others simple acts of love and kindness. It is bringing the light of Christ into someone’s darkness. It is buying someone’s coffee or lunch. It is holding the door open. It is giving a smile and a helping hand. It is visiting those suffering or alone. It is mowing someone’s yard. It is giving someone a ride. It is passing out cards of encouragement. It is visiting those in the nursing home, hospital, prison or jail. It is volunteering at a food kitchen, a church, or an organization. It is anything that you can think of that can help someone else and to us that is how we believe we can ultimately better our planet Earth.